Every month the best improvement idea or improvement story is celebrated in Sønderborg Municipality as a part of the program In Safe Hands. Tellings stories is a powerful tool in improvement work. Unlike facts and data, stories directly affect emotions, and therefore are able to create motivation. Stories can be about patients harmed by for instance a pressure ulcer, or they can be stories about pressure ulcers or other harm, that were prevented. Listen to head nurse Hanne Miang, program manager for In Safe Hands in Sønderborg Municipality in the Southern part of Denmark. QIcomm_KORT_FINAL_180418_UK SUBS from Selskab for Patientsikkerhed on Vimeo. Every month the best improvement idea or improvement story is celebrated in Sønderborg Municipality as a part of In Safe Hands. 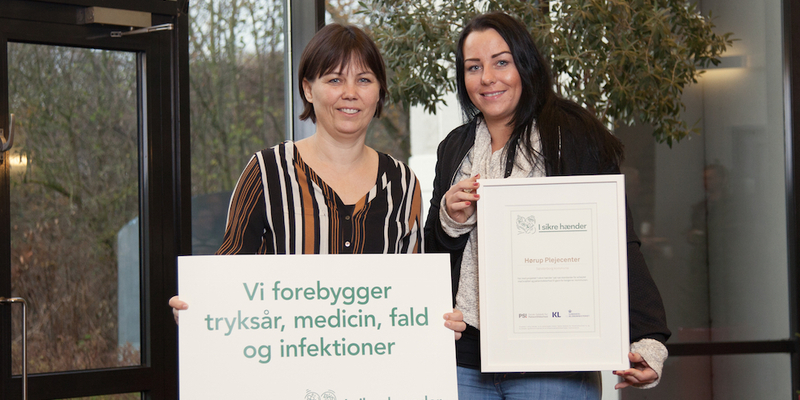 – The purpose of the prize is to recognize the continuous effort of the employees to create safety and the greatest possible wellbeing for our citizens, says Hanne Ellegaard Miang, local manager for In Safe Hands in Sønderborg. The municipality is one of five doing improvement work as a part of In Safe Hands since 2013. The program is currently being spread to another 13 municipalities. One of the ideas that has been awarded “best improvement idea of the month” is protection for elderly people in wheelchairs to avoid pressure ulcers on their feet. – Secondly – and just as important – it is about motivating the employees to express their good ideas and experiences, and use the positive stories actively in the improvement work. Because there is much learning for the entire organization in every single idea and story, Every month, when the prize is awarded, it is mentioned on the municipality intranet so everyone can find inspiration. One of the stories awarded was about the 89-year old women Helga Weinkaus. For three years she was unable to walk. But then she set a goal together with the healthcare professionals at the Broager Nursing Center. After five months of training, she was able to surprise her son on his birthday: She could walk again. The stories don’t have to be success stories. Also, a nurse, who talked openly about a medication error she was involved in, has been selected to promote transparency and an open discussion about adverse events. – The event in Sønderborg is much more than a prize. It is a tool to spread knowledge, learning and ideas. It is a tool to appreciate and celebrate results, thereby creating involvement and motivation for improvement among the healthcare professionals, says Tina Lynge, program manager of In Safe Hands at the Danish Society for Patient Safety.